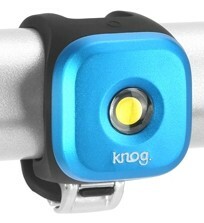 The Blinder 1 is the smallest light in the Blinder series, weighing just 15 grams with a single LED. It's best used as an emergency light just in case you get stuck out after dark, or for people riding short distances on well-lit streets. Although the flash patterns are very attention-grabbing, the light is too small for use in darker areas.